Listening to the music on this album is like reaching into a bag of assorted jellybeans and eating whatever you touch. Sure, most of what you touch you will like but every now and then you find a spicy cinnamon or the inky blackness of licorice and it will make you recoil. This album has music to love and music that makes you wonder why it was paired with the other tracks around it. At times I found myself forgetting what I was listening to. As is my tradition, I have to address the 500lb gorilla in this musical room. Erik Lawrence’s baritone is the dominant voice in this quartet and rightfully so. He takes command and leads this group from out front musically. His tone is not a bright as one might expect for a solo artist but it has bite and depth. His tone is a good compromise between a soloist focused uber-baffled tone and one that would get lost in the mix with the bass. 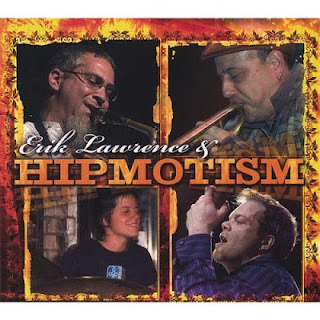 Lawrence’s command of his horn is evident as he moves into and out of altissimo while playing some of the funkiest improvised lines ever played on a baritone. His counter voice on this album is an instrument that I now lust to play with. Steven Bernstein makes the slide trumpet sound like less of a little trombone and more of a glissando happy trumpet. His higher voicing adds breadth to the sound palette that a tenor saxophone or tenor trombone would lack. This works well as both horns are comping each other during solos as there is no piano or guitar to define chords. Instead the bass and the non-improvising musician draw the underlying chords for the improviser. The effect on the listener is that of musicians who love to play and the feeling that these they are connected. There are some superbly inspired New Orleans style funky pieces on this album. “Big Chief” and “Soulville” really stand out as feet stomping and booty shakingly fun pieces. These two are worth the price of admission to this musical wonderland. After each of these pieces is sandwiched tunes which are a akin to the funeral dirges you hear on the way to the cemetery in a New Orleans funeral. They are great in their own and provide contrast but with the tempo set to “fun” these pieces bring you back to earth rather harshly. This album has a couple ahead jazz pieces as well and a bit of an unexpected gem, the Beatles song “Come together”. This piece is worth mentioning on its own because musically there is a great deal happening at all times. From jingle bells ringing like gentle rain in the background to Bernstein’s breathy slide solo, This piece changes pace often, and is led by the subtly hip drums. Then, like a funk bandit, Lawrence begins his solo and gives the funk beat something to push against. From there Lawrence slowly builds his solo and by ½ way though his solo Rene on bass hits his phaser and distortion pedals and reminds us that this is and was a rock song. TAKE AWAY: I like this album and will likely rip it to my ipod. Not all of the songs but most of them to be sure. This is the type of album I would recommend listening to on iTunes and buying the tracks that you like. You are bound to like more than half.